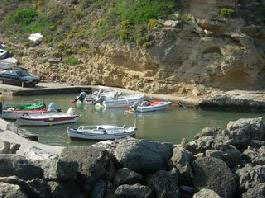 At the southernmost edge of Kefalonia is located Pessada, a small village and harbor. It belongs to the region of Livathos, covering the southern part of the island and has 233 permanent residents, according to the 2011 census. Pessada is the port of Kefalonia that connects the island to the north coast of the Zakyntos, the port of Agios Nikolaos in Volimes. In Pessada, you will find tourist infrastructure, enough to be able to accommodate many visitors, while there is still an agricultural clinic, library, soccer and tennis. The beach of Pessada is beautiful and quiet, ideal for a quiet day in the deep blue of Ionian Sea. It is unorganized and you will easily reach to it by the village, descending the stairs and follow the small path to the sea. The church of the Apostle Paul and Evangelistria are the most important churches of Pessada. On Easter Monday (Easter Monday or New Monday), is the liturgy of the icon of the Annunciation, followed by an Easter treat for the faithful and pilgrims to the Temple. The “Pessadiana” is a folk song of Kefalonia, which is written for a young woman of Pessada, in the early 20th century.